Pick you up from Dahab hotel with private modern vehicle and transfer to Sharm airport then fly to Cairo. Explore the magnificent Pyramids of Cheops, Chephren & Mykerinus, also the Sphinx of pharaoh head and lion body then wander the Valley Temple of king Chephren. Get your lunch in local restaurant then move onto the Egyptian Museum strolling a huge collection of about 160.000 pieces that covers 50 centuries of Egypt history including the valuable exhibit dedicated to king Tutankamun. Evening transfer to Khan El Khalili Bazaar te oldest and most famous in Middle East, you will get enough free time to get around and purchase souvenirs before transfer to Cairo airport for Luxor flight, meet and transfer to the hotel in Luxor and overnight. 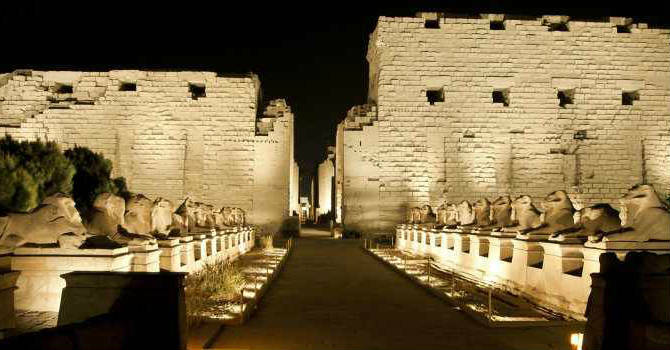 Pick up shortly after breakfast in hotel then transfer to Karnak Temple, it is the biggest worship temple ever built, dedicated to the sun god Amun and his triad, it is a temple complex of 3 temples and represent great achievement of several generations of ancient builders. Get your lunch in local restaurant then cross the Nile to the West Bank, stop at the two colossal statues of king Amenhotep III also known "Colossi of Memnon", then visit the famed Valley of the Kings where the impressive tombs been discovered, you will visit three tombs excluding Tutankhamen. Visit the temple of Hatshepsut at El Deir El Bahary, established and dedicated to this powerful female pharaoh who ruled Egypt for about 20 years. Transfer to Luxor airport, fly back to Sharm than transfer to your Dahab hotel.